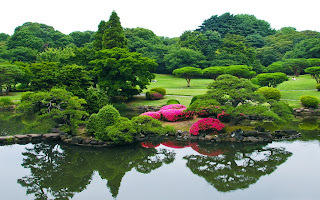 Shinjuku Gyoen National Garden is a garden which is often used as a place to relax for Japanese residents and tourists. Located in the district of Shinjuku, Tokyo, Japan with a broad reach 58.3 hektarare and divided into 3 sections with different themes, namely French Formal, English Landscape and Japanese Traditional. Each part of the park comes with its own privileges. For example, the Japanese Garden there is a Japanese tea house, which took place at a certain hour Japanese tea ceremony (additional cost). This park is under the management of government since 1949 and before becoming a public park, formerly used as a residence of the Naito family in the Edo period. Visitors are always coming in each season. But in the spring or fall, will visit the park is more crowded. 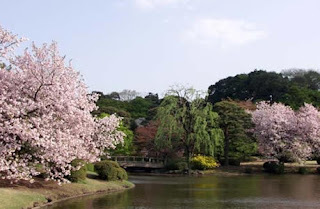 That is because the culture of Japanese society in making the event Hanami or picnic along to see sakura in spring and Momiji, enjoy the view of the red maple leaves in autumn. When you want to see the cherry blossoms, visit in March or April. Whereas if you want to see the roses can come between late April to early June. Although not found in the winter landscape of blooming flower beds, visitors can still see the beauty of the park through the trees begin to shed branches and yellowing grass.